UNDP has been a top-performing aid organization in Transparency related assessments and donor reviews continuously over the past six years. The achievement demonstrates the culture of transparency created throughout the organization. This course has been developed to familiarize all UNDP personnel with key principles surrounding transparency and actions required by them to implement the IATI Standard at UNDP. Welcome to the UNDP training course on IATI implementation. Development actors all over the world have acknowledged the need for greater transparency, including this as a political commitment in a number of global processes including activities related to development and humanitarian work. As a signatory to the International Aid Transparency Initiative (IATI), UNDP has worked hard to fulfill and exceed its commitment to transparency in a way that benefits both donors and recipients of aid. In this short training course, you will learn about aid transparency and the process of implementing IATI within UNDP. This course is designed to give you the opportunity to learn about the concept of IATI and its implementation and to apply what you have learned at work to support UNDP's efforts to improve data quality and its compliance with the IATI Standard. Transparency is a key principle of development effectiveness. Better planning and coordination: Access to timely and quality information enables development partners to plan their work and manage resources effectively. Improved beneficiary feedback process: Making relevant data available helps citizens to voice their feedback and engage with policy makers. Maximizing development impact: More widespread availability of information enable effective collaborations and maximize development impact. The International Aid Transparency Initiative (IATI) is a voluntary multi-stakeholder initiative aimed at increasing transparency by enabling organisations to publish information on their aid, development, and humanitarian activities in a common format. The following short video will provide a brief introduction to what it is and how it works. At the High Level Forum on Aid Effectiveness in Busan, 2011, development actors committed to "implement a common open standard for electronic publication of timely, comprehensive and forward-looking information on resources provided through development cooperation,” that takes into account the statistical reporting of the OECD-DAC and work of IATI. United Nations agencies were part of this agreement and are required to fulfill the commitment. A number of systems and databases exist to report and capture aid information, but IATI is the only recognized system to make aid and development information easier to access, use, and understand in an openly accessible and comparable format. 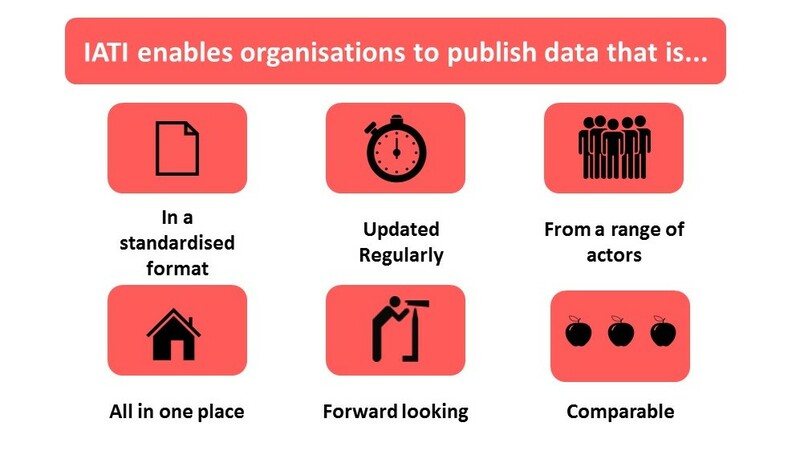 IATI provides the common format for organisations to publish their information which can be compared and combined with other datasets and used together. It is aimed at improving the availability of historic, current and future resource flows reported by a broader range of development cooperation providers. Satisfies requirements by donor countries such as the United Kingdom and the Netherlands to publish information to IATI. Promotes UNDP's image as one of the most transparent global development organisations. 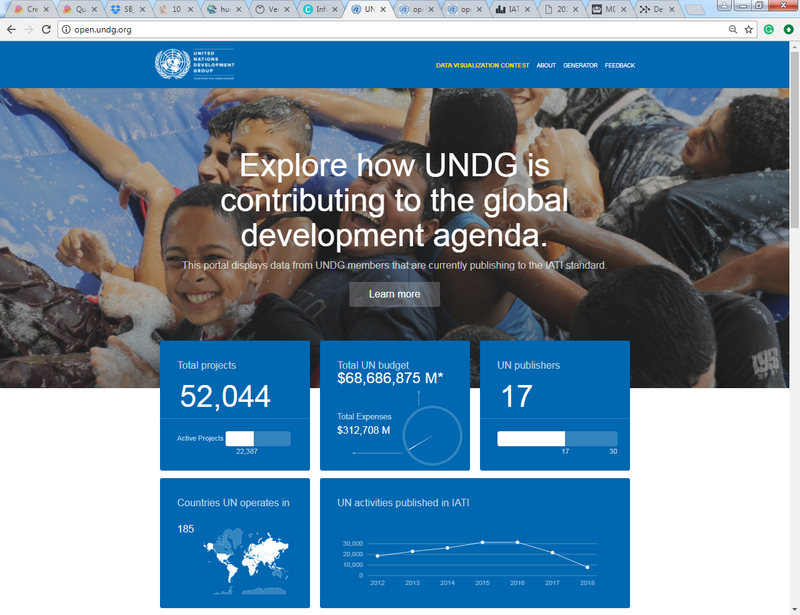 Provides access to UNDP information in a comparable format which can be combined with other aid agencies' data and used effectively by data users including developing country governments and other aid actors. Improves internal data quality which in turn helps UNDP carry out better planning and management of resources. Making information transparent alone will not help to improve aid effectiveness. The information must be useful enough to act upon to make better decisions. IATI operates on three key dimensions which could contribute better decision-making and greater effectiveness. It is critical that IATI publishers pay more attention to these important dimensions in producing IATI data. Data is kept up-to-date and updated regularly. The publisher reports the maximum number of activities (eg. all development projects) and includes maximum level of information (IATI elements) of those activities. Usability of data for the indicative purpose such as planning and budgeting. Adopting the IATI Standard starts with preparing the organisation. It may involve establishing the business case for the organisation, getting buy-in from senior management and other stakeholders and setting up teams and processes to start publishing. In UNDP this has been underway and successful for many years. Once an organisation joins IATI it has to first decide what information it is able to publish. IATI implementation schedule outlines the details of an organisation’s commitment to publication. UNDP reviewed and completed the schedule to confirm UNDP's commitment to publish relevant information. Submitting an implementation schedule to IATI is no longer mandatory but completing the schedule helps the organization to think through the elements it will publish as well as the timeframe. Initially, UNDP decided to start publishing just a basic set of information available in UNDP's Enterprise Resource Planning (ERP) system - Atlas. UNDP extracts information on both project and output levels which is directly taken from Atlas by mapping the Atlas fields to IATI elements. Gradually, UNDP started using other platforms such as the Corporate Planning System to collect data which was not available in Atlas. The data extracted from relevant systems is then converted into IATI’s agreed electronic format – eXtensibleMarkup Language (XML), a format which can be easily converted into other formats and used. The information is published in two different datasets - organization and activity XML files. The organization file contains financial information and documents at the corporate level, while the activity file captures the project and output level information and documents. The organisation and activity XML files are made available to the IATI Registry where all IATI publishers' information is registered. Once the file is available on the IATI Registry, it is open and can be accessed and used by anyone around the world. Over time publishers look to improve their datasets by increasing the amount of information published, updating the datasets more frequently and more importantly, improving the quality of data. Since the initial data publication, UNDP has vastly increased the amount of information published and keeps working on data quality improvements. UNDP keeps the information up-to-date by refreshing the XML files every month. The IATI Standard continues to evolve to accommodate emerging needs around development cooperation and humanitarian responses following a rigorous and consultative change management process. IATI publishers are expected to keep up with standard updates while improving and complying with the Standard, which requires the correct application of standard schema, codelists, and rulesets. Rulesets: Provide additional instructions on conditions and logics within the schema. IATI is a voluntary initiative which allows publishers to determine what information they will make available using the standard. However, the publisher needs to satisfy the requirement by including the mandatory information required by the standard, while deciding to publish additional information voluntarily. The publisher also has the option to publish information on all of the organisations' activities or only selected activities. The decision on what to publish and what not to publish is generally driven by the organisation's Information Disclosure Policy (or open data policy) and the data availability. Public disclosure is guided by an organisation’s Information Disclosure Policy (IDP), which is not only used to define what type of information the organisation can make public but also highlights the restrictions through “exclusions” for confidentiality, security purposes, and commercial protection. It is also used for expressing the commitment towards transparency, both internally and externally. UNDP's IATI publishing is guided by its own Information Disclosure Policy. UNDP is committed to publishing as much information as possible. However, recognizing that not all information can be made available to the public due to reasons such as security concerns around certain activities, the publication is still subject to the exclusions mentioned in the IDP. The IDP not only provides the guidelines for IATI data publication but also provides the general guidelines for UNDP's public disclosure. It also explains how the public can request additional information and the procedures for handling those requests. Currently, UNDP does not withhold any of the information required by the IATI Standard but allows exclusions, if relevant. UNDP publishes information on all active development projects which are financed by Programme funds. The dataset may also include other types of projects (e.g. Management or development effectiveness projects) if those projects have utilized programme funds. Active projects are the projects having an active budget or financial transaction for the current year. Regardless of the project status, any projects which have financial transactions for the current fiscal year will be included in the IATI dataset. For example, a project with 'financially closed' status will be part of IATI data publication as long as it contains any financial transaction for the current fiscal year. UNDP publishes only approved active projects which have "implementing" or "closed" status. No information on pipeline projects is made available in IATI. Depending on the IATI standard version in use, the publisher must include the mandatory elements required by the specific version of the standard. UNDP is committed to keeping up with the IATI standard upgrades and ensure the datasets are successfully validated against the XML schema in use. Activity status: Mapped to Atlas output status. Recipient Country or Region: Country projects are mapped to operating unit countries and regional and HQ projects are mapped to regions. IATI implementation is a collective effort requiring contributions from various internal stakeholders across the organisation. The commitment to adopt the IATI Standard has been made by the senior management, but the commitment to implement the standard is expected from UNDP as a whole. The transparency team in HQ is responsible for publishing data to IATI registry. However, the responsibility to confirm the accuracy and completeness of the information remains with country offices and other relevant HQ and regional units. Office of Operations, Legal & Technology Services (OOLTS): Responsible for ensuring that required tools and processes are in place to collect and publish data (OIMT), Procurement related data (Procurement oversight) and Information Disclosure Policy (Legal). Transparency team ensures that proper systems and guidelines are in place to collect, process, publish and update data regularly. Project managers are required to input IATI-compliant-data in relevant systems following UNDP’s internal IATI guidelines. Regional bureaus are expected to follow up with their respective country offices to ensure all required data is provided and complete, according to the timetable set out by the transparency team. Why is internal data review important? UNDP’s reputation for accurate and complete information is a chief priority for units that are uploading IATI-compliant-data into Atlas. Transparency alone does not ensure UNDP’s reputation as an effective organisation. We must achieve the highest quality of information in our internal systems so that published information is accurate, meaningful, and easy to understand by the non-specialist external audience. Open data provides a strong incentive for all IATI publishers to improve the quality of information they share, and this begins with capturing quality information in their internal systems. UNDP carries out an annual data review exercise requiring COs and other relevant HQ and regional units to review their project information to ensure that all information provided is accurate, complete and up-to-date. Where can I review my data? UNDP's intranet-based transparency dashboard displays all project information in one place providing one point access to all relevant project data. open.undp.org also provides a platform to how the data published to IATI looks to an external viewer. Project managers are expected to identify the missing information which is highlighted in "red" for easy reference on the transparency dashboard. In addition, the existing information must be checked to confirm its accuracy and clarity. How do I add or correct my data? Any additions or corrections must be carried out in the data source, not the dashboard. This means that project information changes must be made in Atlas, documents must be uploaded in the Project Document Centre and sub-national locations must be added in Corporate Planning System. The dashboard provides a platform for monitoring purposes, but it is also used as a user interface to help users to navigate to the relevant locations to add or correct selected elements. For example, currently the dashboard is used to direct users to the Corporate Planning System to add project locations, and to the Project Document Centre for uploading documents. Who is responsible for monitoring of data? Project Managers and Regional Bureau desk officers. Project managers are expected to check the detailed information of their respective projects, whereas desk officers are mainly required to monitor the statistics of their relevant COs to confirm all required information is provided. Should I check financial data? No, financial data based on the transactions within projects is taken directly from Atlas. However, Project Managers can use the dashboard to identify any major deviations in financial data and should alert the transparency team to any inconsistencies found. Yes. Since UNDP data is now open to public scrutiny, UNDP staff must take necessary care to ensure the data published is checked for accuracy and completeness. UNDP refreshes IATI data every month by automatically extracting the data available in the systems. Since there is no additional data quality check is carried out at the HQ level before publishing the data to IATI, it is extremely important that operating units monitor their project data and take corrective actions to confirm the data quality. How can I report any inconsistencies and how long it takes the changes to take effect? COs and other operating units should contact transparency team ([email protected]) for all transparency related queries or to report any inconsistencies found on transparency dashboard. UNDP refresh IATI data at the beginning of every month and therefore, any changes made during the month will take effect from next month update. However, COs and other operating units should contact transparency team ([email protected]) if there is any urgent update required to IATI data due to the sensitivity of the information published. What type of documents should be uploaded in Project Document Centre (PDC)? Any pre or post impact appraisals - "Impact Appraisal"
Any contract for acquiring goods and services need not be uploaded. The summary information of all contract awards (above USD 30,000) is taken directly from Atlas and published on open.undp.org. Evaluation documents included in the organisation’s evaluation plan and uploaded in the Evaluation Centre are systematically taken for IATI publication and need not also be uploaded in PDC. Project Managers are only encouraged to upload any additional evaluations in PDC, if available. Project and output title: Project Title should be the same as the one shown in the signed Project Document. Avoid acronyms. In the case of very long project titles, project managers should provide a short but meaningful title with more than ten characters, using acronyms only for long organisation names. Project and output descriptions: Project description should provide a concise and easy‐to‐understand explanation of the project which must include more than 40 characters, also avoiding acronyms. Implementing partner: Ensure that the Institution ID for an implementing partner is correct and updated. It is important that implementing partner organisations' names are correctly provided in Atlas, avoiding generic names such as “National implementation’, ‘Direct implementation’, ‘NGO’, ‘NEX’, or ‘DIM’. For example, a national implementation project should have the implementing government agency name provided as the implementing partner. Project Location: All country projects should have sub-national locations provided at output level. Output can have one or more locations provided depending on the scope of the output. Providing the country name as a sub-national location should be avoided and only included if the scope of the project is national and not covering a particular region, state, province, district or city of the country. Documents: IATI includes multiple activity level documents capturing various types of relevant information. All development projects must at least have the ProDoc uploaded and available for public disclosures. Project managers are expected to upload all available relevant documents in the Project Document Centre and confirm that the document can be made public by tagging it as "public" in the classification level. PDC is also used for sharing documents for internal purposes and therefore, it is important that the user defines the classification level correctly to tag documents which are not for public disclosure with the tagging of "internal use only" or "confidential". SP-output linkage: All outputs should be linked to one of the UNDP's Strategic Plan outputs. This information is also used for identifying the relevant OECD sectors. Gender Marker: All outputs are marked with the Gender market values. Output results: All units should provide output indicators, baseline, target and actual results in Atlas and review them on the transparency dashboard to confirm if they are ready for public disclosure. IATI data is often used by donors and other independent agencies to assess a publisher's performance on transparency indicators. Since donor countries are increasingly recognising the importance of IATI as a universal reporting standard, IATI publishers are subject to scrutiny, more than ever. Transparency is at the core of UNDP’s work and it is vital to achieving improved trust and confidence in development work. 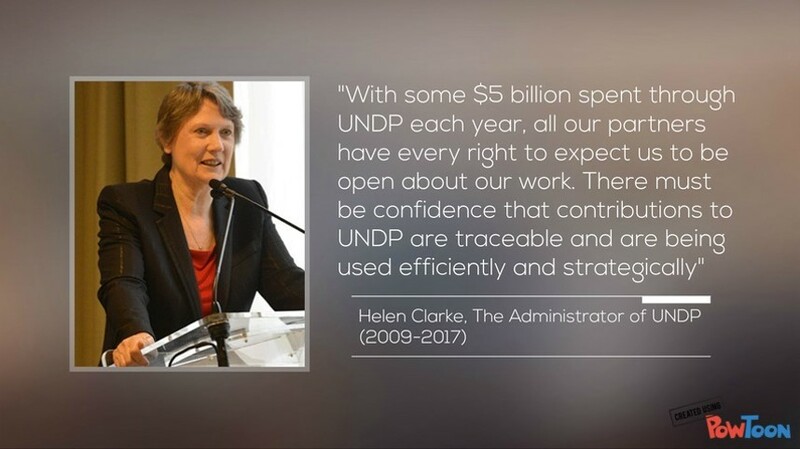 UNDP takes transparency assessments seriously and has been a top-performing organisation in all past transparency assessments and donor reviews, exhibiting the transparency culture and successful implementation of the IATI Standard across the organisation. The Aid Transparency Index is an annual transparency assessment carried out by Publish What You Fund (PWYF), an international NGO based in the UK. It is the most widely recognised independent measure of aid transparency, and currently assesses the aid transparency among major aid organisations. After an initial pilot assessment in 2011, the Aid Transparency Index was first launched in 2012 and has become the global benchmark for aid transparency. Based on the final score, PWYF ranks each organisation in the Index and places them into five categories – Very good, good, fair, poor and very poor. In 2014, UNDP became the most transparent organisation in the world by topping the Transparency Index with an overall score of 90.64%. In 2016, UNDP managed to retain its top position for the second consecutive assessment by becoming the only organisation to score above 90%, with an overall score of 93.3. Remaining its position as a top performer in the Transparency Index is one of the top corporate priorities for UNDP. The Global Partnership for Effective Development Co-operation (the ‘Global Partnership’) was established in Busan in 2011, and carries out regular global monitoring exercises to track the progress on the implementation of development effectiveness principles through a range of indicators, focusing on strengthening developing country institutions, increasing transparency and predictability of development co-operation, enhancing gender equality, and supporting greater involvement of civil society, trade unions, parliaments, and private sector in development efforts. Transparency is one of the ten indicators. Donor countries are increasingly recognizing the importance of IATI as a reporting standard, and major donors such as the United Kingdom’s DFID and the Netherlands have already made IATI reporting as a mandatory requirement for their implementing partners. Transparency has become an important aspect of multilateral aid, and the organisations are now subject to scrutiny on what they publish and what they do not publish. In 2016, DFID carried out a Multilateral Development Review which assessed the performance across the multilateral system examining the agencies receiving funding from DFID. 'Transparency and accountability' was one of the three components used in the assessment framework for assessing the organisational strength, and IATI publishing was the indicator to determine the transparency component. "Some agencies, for example, UNDP, have gone beyond the basic requirements and are demonstrating a culture of transparency across their operations, such as increased use of client surveys and beneficiary feedback mechanisms. Such behaviour was necessary for agencies to achieve the highest scores." The IATI Registry provides links to all raw data officially published by organizations using the IATI Standard. It serves as a single point of access for users to find and access IATI data released by all organizations. UNDP presents the same information that it publishes to IATI on its transparency portal open.undp.org. This provides the public with easy access to the information published in the not-so-human-friendly format of XML in the registry. 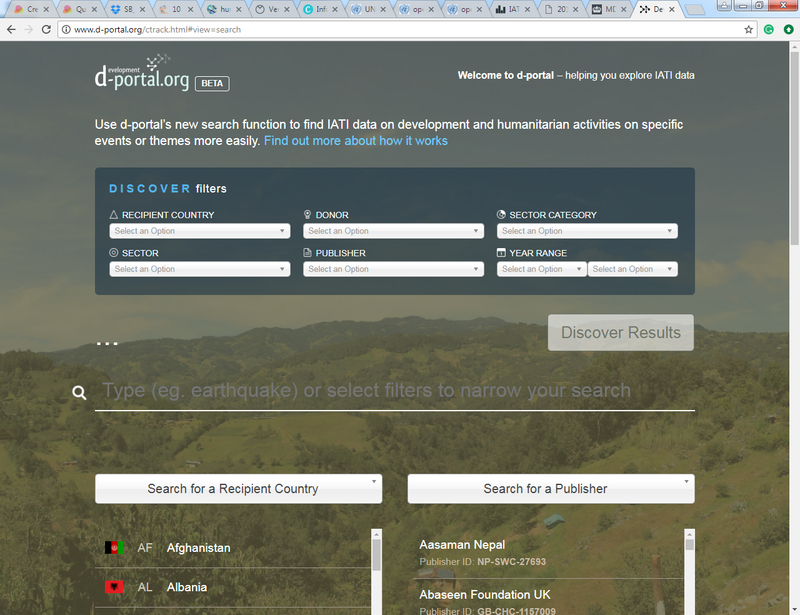 d-Portal is the official IATI country-based information platform that tracks resource flows and aims to provide developing countries and others with information that can help plan and monitor development activities. It presents all data published to the IATI Registry and enables UNDP data to be compared with other IATI publishers at country and sector levels. The UNDG portal presents the IATI data in a similar format to d-portal.org, but is restricted to showing only UN publishers. This portal provides the opportunity to view aggregated aid flow data from UN agencies to partner countries and sectors. Within a short period of time, IATI has enabled various types of organisations to publish a great deal of humanitarian and development data in a comparable format which has opened the door for a range of possible use cases. IATI data has been already used by recipient countries and other development partners for planning, budgeting, monitoring and advocacy purposes. Currently, IATI data is mainly used to showcase the organisation's commitment to transparency and the credibility as a development partner. Data portals are created by using IATI data to visually present comprehensive information about the organisation and its activities. D-portal shows who is funding what and where within a country. Partner countries use these details of external resources coming into their countries to lead in coordinating development partners and to direct resources to sectors or areas that needed most. IATI data has been successfully tested for automated data integration into partner country Aid Information Management Systems (AIMS). This allows partner countries to avoid the painstaking manual effort of inputting all data into AIMS. It has also increased the information available for AIMS by providing data from those IATI publishing donors who are not part of the local AIMS. 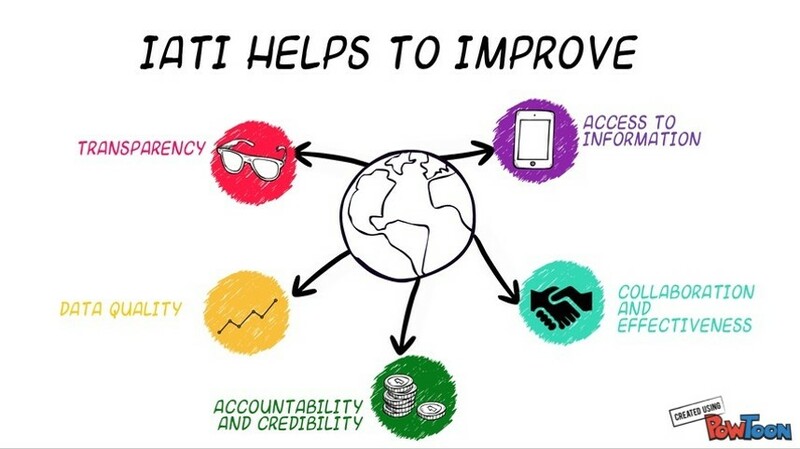 IATI data enable donors to gain insights into an organisation's work and results, which can be potentially used for monitoring purposes to hold implementing partners accountable for where the money goes and what are the results. At the project planning phase, country offices are encouraged to use IATI data to identify other development partners working in a sector or location in order to leverage synergies and avoid duplication. IATI has helped UNDP to produce high-quality internal data which can be used for improving internal management and programme efficiency. It also increases the accountability as UNDP publishes results which can be scrutinised by donors, public, and media. IATI data is used to improve donor relations by providing access to up-to-date information on those activities funded by the respective donors. It serves as a single point of access to check all relevant information and critical documents. It can be used as an effective communication tool. open.undp.org and d-portal.org can be used to demonstrate the project interventions and results effectively to donors and partner countries. For example, a simple use of project map to show intervention areas and relevant financial flows can tell an effective story. IATI data should be used in the donor and beneficiary feedback process. Improved data availability and sharing mechanisms are an essential element of the feedback process, and IATI data could provide just what the donors and recipients are looking for. UNDP COs and HQ units are already using open.undp.org to find information on UNDP activities. IATI data provides better insights of UNDP activities around the world and can be used as a quick access point to search and find information on UNDP's activities. 3. Share all information available, but be conscious of exclusions. Make sure all relevant information is shared but make sure not to share anything contained in the information disclosure policy exclusions. 4. Know the internal procedures for data input. Knowing the steps involved will help you provide information effectively and reduce the time spent on data input. 4. Always review the data before saving. Make sure you always double-check the details to ensure the completeness and accuracy of the information provided. 6. Know your systems and limitations. Knowing the system fields where the data is taken from will help you to ensure that the required information is made available for public disclosure. For example, most of our staff still do not know that the projects locations are taken from corporate planning system and still wonder how they could add locations in ATLAS. Staff also often end up providing incomplete titles and descriptions by copy pasting titles and descriptions from project documents, not realizing that project title and short description fields in ATLAS project management module have character limitations. Remember, knowing the limitation will allow you to rephrase the long titles to make short but meaningful titles to fit within the maximum number of characters allowed. For example, maximum of 30 characters allowed for titles. 7. Use your judgement. What to publish or not is guided by the IDP, but not all circumstances are explicitly specified. So, be aware of the consequences of making sensitive information available for IATI publication and if you are not sure, seek advice from legal or transparency team. Thanks for completing the course! I hope this course has helped you to understand the IATI implementation process better and lead to perform IATI related tasks better in future. Which one of the following is not a characteristic of IATI standard? What are the key dimensions of IATI?